Elvis WEEK August 2009 and it sure is HOT. Today was 34°C, 93°F and a humidity of 42%! But where else could your true Elvis-lovin' fan possibly be at this time of year? WELCOME BACK, once again. August 2009 and it sure is HOT today was 34°C, 93°F and a humidity of 42%! But where else could your roving reporter be at this time of year? 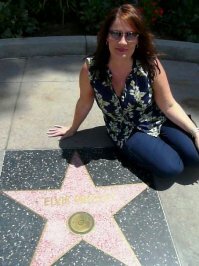 This year I dashed through Las Vegas and the wonderful L.A. on the way, just to say 'Hello' to some old Elvis friends say 'Hi' to Elvis' Hilton statue and to help shine up our man's Hollywood plaque - which I have to say was in need of a good shining & rubbing from me! There is a kind of excitement in the air with the tent up and ready to go for Elvis Week's official opening tomorrow. A lot of the hotels are full-up and there's a buzz in the air. Looks like 2009 Elvis Week might be a fairly big celebration. "Lord almighty, Feel my temperature Rising"
Read all the EIN exclusives below. 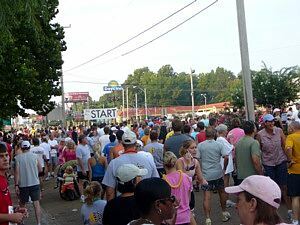 It was a very early start this morning - as in up at 6am to be a Graceland to register for the 5k (3 mile) Fundraising Walk/Run. 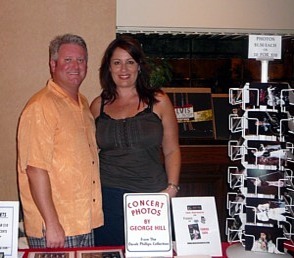 There was a huge turn out for this fundraising event. 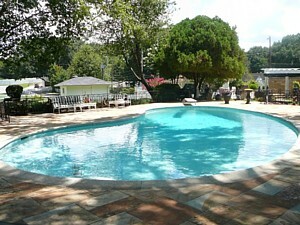 The entry fee was by way of a donation of $25 with all proceeds going to the Memphis Cerebral Palsy Foundation. Start time was 8am and there were lots of Elvis fans mixed in with Memphis citizens, dogs, kids and strollers and even the navy! After the walk, the Graceland Plaza area next to the Lisa Marie, was turned into a party area with food, drink and refreshments (including free beer and a sausage sizzle) and a live band. It was a fun event and all for a worthy cause - I would definitely recommend everyone participate next year. After this event I headed downtown once again to stop by the Mississippi to check out the Elvis Statue that can be found in the Mud Island visitors centre. 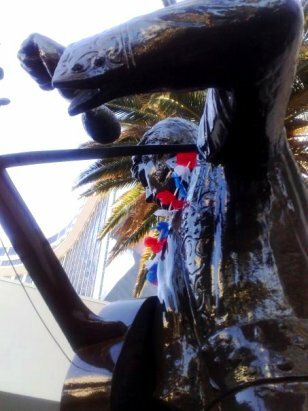 This statue used to be on display out in the open many years ago, but was relocated due to fans breaking off the fringes on his jumpsuit for keepsakes! The statue is double life-size and stands proudly at the front of the building. There is also a great BB King statue further inside. Then a quick side trip to the Conversations on Elvis at the Cannon Centre. Lovely to see James Burton who of course will be commemorating the 40 year anniversary of "Elvis 69" in Shreveport Louisiana on Aug 21st with the most amount of guitarists playing "That's Alright" at the same time. If anyone who plays guitar wants to join in, all they have to do is register & play. The new Cirque Elvis show was unveiled today too. We got to see how the purpose built theatre will look & how the guys behind it have tried to include all aspects of Elvis' personality in it. 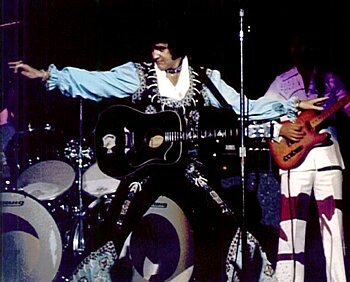 They say that when you come to the show, you will sense Elvis' amazing presence. The producers have apparently become Elvis fans from only just knowing about him. They also say that the "music" will be the biggest feature. Also, there are 2 acrobats in show from Australia. 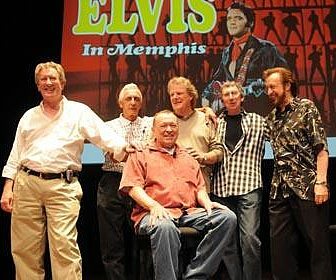 The Memphis Boys & Chips Moman together again on stage. A well deserved ovation for all the marvellous music they created with Elvis 40 years ago. There was a Grammy certificate Presentation to all of them for Suspicious Minds from the Memphis chapter which sees them inducted into the Grammy Hall of Fame. Ernst Jorgensen talked about Elvis music and the future Elvis releases and was as brilliant & eloquent as ever. Otherwise there was little new information but to sit in audience & listen to him gives an insight into the absolute perfection he strives for & achieves in his work. From here, it was back to the Graceland area for a few events before the candlelight vigil later that night. First up was a SONY presentation to EPE of several gold and platinum records for Elvis (7 or 8!). Jack Soden was there along with Gary Hovey (Priscilla's brother in law) and several other EPE representatives. After that ceremony we were treated to a look at the new proto-type Elvis Harley Davidson Special Edition. The lucky owner of this amazing bike was Rick Hills from Western Australia - I had a chat with Rick, who is a huge Elvis fan and has one of the largest Elvis collections in the world. He already has the earlier model Elvis Harley (which he displays in his lounge room) - and this one to will be disassembled and shipped all the way to Perth in Australia. Next stop was the meet and greet for Wayne Carman - who was signing copies of his Gladiators Karate dvd and book. The DVD consists of footage of Elvis in 1974 practising karate - of course we have all seen snippets of this footage, but the DVD (with no audio) has a full 40 minutes of very rare footage and also comes with 6 colour photos Elvis karate postcards - a great buy at $10 - and much better value than the $40 book that was also on offer. 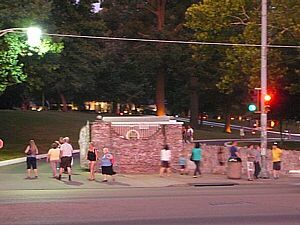 After taking in a few more acts at the tent - it was time to walk over to the gates of Graceland for the candlelight vigil. By the time the always emotional ceremony started, there was a crowd of around 6,000 people. 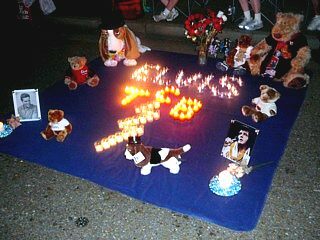 After brief ceremony (with a new MC from EPE in the absence of Todd Morgan), the music began and fans were allowed to walk single file with thier candles up to Elvis' grave in the Meditation Garden. Once again Memphis turned on the heat for what turned out to be an incredibly humid evening. It took hours for a lot of fans to get through those special gates. It is always an unforgettable experience that words cannot properly explain, but something that every true Elvis fan should share at least once. so until next year, adios - and I bid you all an affectionate farewell. 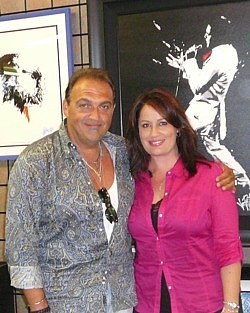 Click here for MORE Sanja Photos of Elvis Week. Today was my Tupelo pilgrimage. Interestingly they have moved the church that Elvis used to go to onto the local grounds. 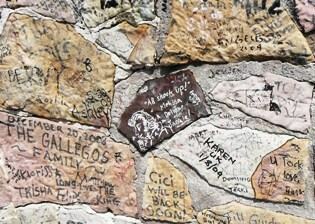 It now stands next to the chapel and Elvis' house and you can tour it. There is the statue of Elvis at 13rs old (added in 2002) and also now around the house there are concrete plaques celebrating each year of Elvis' life ie.1935, 36 ,37 etc right up to 1977 - and a little something about what he did that year - but only for the years he was in Tupelo. 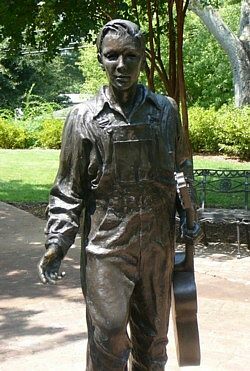 - Went to the Tupelo Hardware Store, where of course Elvis bought his first guitar. In there we met Howard Hire (right) - whose wife 's grandfather owned the store when Elvis came in on that fateful day. Mr Hire was charming and took the time to tell us about the 3 times he saw Elvis in concert - Tupelo, Hawaii and Memphis in 1974. 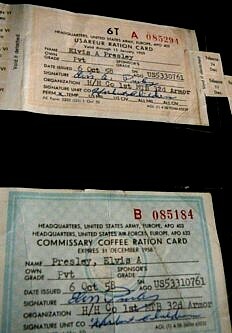 That was his favourite concert of all and he recollected how exciting it was to be in the audience when Elvis sang American Trilogy that night. He described it in a way that gave us all goosebumps. Particularly when he described how a gigantic American flag was unfurled on the stage just as the flute was playing. He said the entire arena jumped to their feet simultaneously - men, women, boys and girls. He said it was a moment he would remember for the rest of his life. Another of my favourite Tupelo spots is 'Johnnies Drive In' where I stopped for lunch and where Elvis used to go to eat during his Tupelo days. It has not changed a bit and has hardly been renovated. 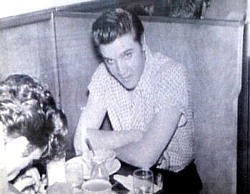 We sat in the exact booth where Elvis used to sit - and above it hangs a photo of him sitting there - very surreal. Where could we be in the evening but at the 1969 concert at the Cannon Centre. Man, it was BRILLIANT. Terry Mike Jeffrey, and Andy Childs were simply amazing. The Sweet Inspirations, The Imperials, TCB band and 2 original members of the Joe Guercio orchestra - who played in Vegas with Elvis were there. (on organ and trumpet). The acoustics and sound in that building was breath-taking. The band absolutely rocked. 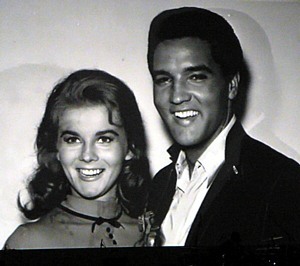 There was footage of Elvis shown throughout including great Las Vegas 1969 stills, home movies and unseen photos of Elvis and Ann Margaret that Graceland has just released. There was also a fascinating re-enacted of the 69 Press Conference - with someone (not sure who) with a voice uncannily like Elvis. (No video or sound from the press conference of Elvis has yet been found). This re-enactment went on what documentation they could find on the press conference and interviews they have done with people who were there. The Sweets and Imperials sang 'How Great Thou Art' - just themselves, with Terry Blackwood on lead and it was spectacular (and bought many people to tears, me included!) Overall, this concert was nothing short of spectacular. 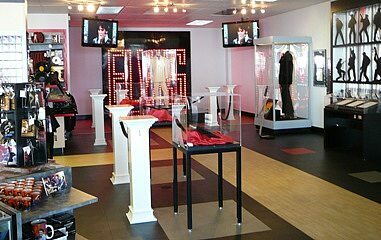 As a lovely bonus the lobby had Elvis' clothing from his 69 shows on display and a big roulette table and Vegas showgirl. I met the lovely Ken Sharp and had a chat to him. He was signing copies of his book and they were disappearing fast. A taste of Beale Street and it was time to head home. 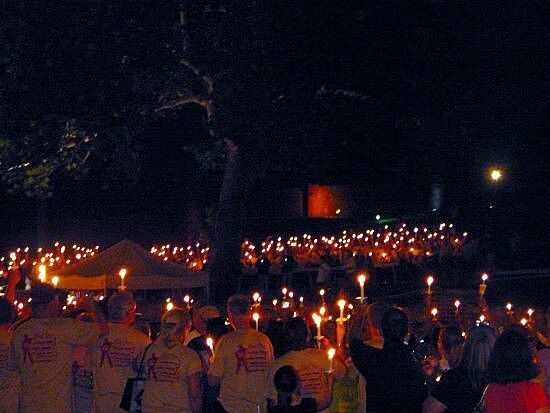 I have another huge day planned for tomorrow - The 5k walk, Gladiators DVD release, The Sony Presentation and of course the Candlelit Vigil. If you see me make sure you say Hello! and boy have I been getting some "Good Rockin' Tonight", Elvis would have been proud. I was up with the dawn - or did I forget to go to bed? - but it seemed that I was back on rockin' Beale Street before I had even left it. It was 9.30am and I was there for the fun of the "music note" dedication for Dewey Phillips. His 2 sons Jerry and Randy were there. Interestingly I also found out that there is a new Broadway show in the works called "Memphis" and there is a character in it based on Dewey Phillips. After the unveiling of the note on the sidewalk, they invited us all to a blues cafe (owned by Morgan Freeman) for morning tea with Dewey's family. Jack Soden gave a speech and as always I met up with him afterwards for a quick chat. I hadn't seen him since 2007 but he said some very nice things about this particular lovely EIN Elvis website (yes, he keeps in contact too). Jack also said that, despite some rumours being spread around, the plans for new Elvis convention centre and hotel etc are definitely still going ahead but have only had to have been slowed down because of the economy. After spending half a day at the Clarion yesterday I checked out the two other Elvis conventions at The Peabody and The Scottish Inn - but both were disappointing and not much of interest. It's just like the old days and The Clarion is the best this year by far, and it is also free entry. 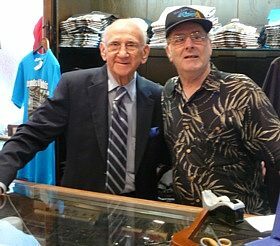 And what would a trip to Memphis be without stopping in to see my lovely feisty friend Bernard Lansky? He must have a pact with the devil as he never looks any older and as always was giving out as good as he gets! What a lovely man. 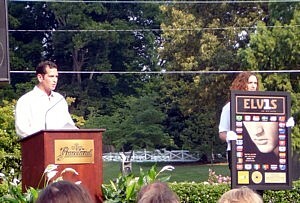 Congratulations to Bill Cherry (right) for new 2009 Ultimate ETA Winner. Didn't I say yesterday that Joseph Hall wasn't gonna make it? Rumours on the street are that 'Shawn Klush' may have overdone it with the "surgical improvements" recently. His concert was a great success - but some fans said that he looked far more "natural" last year and that he should be more careful. The night rolled out as we hit the Hard Rock cafe to check out the Elvis Memorabilia (Elvis' Lion Belt above) and soak in some good vibes before kicking on to our Annual "Echat" reunion dinner at Marlowe's with 18 of us close-buddies managing to make it to Memphis this year. We rocked on to the Graceland Tent which was jam packed and mostly with Danny McCorckle singing who was brilliant. The highlight of the night was running into lovely Joe Petruccio (right) and he had time to entertain me as I watched him drawing and sketching. He is so incredibly talented and let me tell you he is the nicest guy. 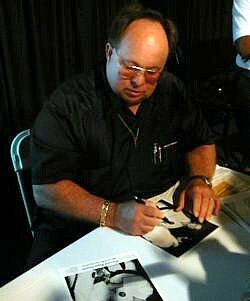 Make sure if you are in Memphis that you meet up with Joe as he will be signing and doing "meet and greets" both on Friday and Saturday nights too. 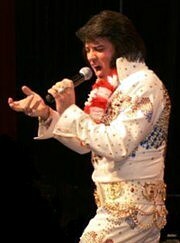 Full day in Tupelo tomorrow and the TCB Band concert tomorrow night. Jerry Scheff has said that he won't join the band on their European tour - but that's already on the front page I see! 'Cause tonight I'm gonna rock away all my blues. 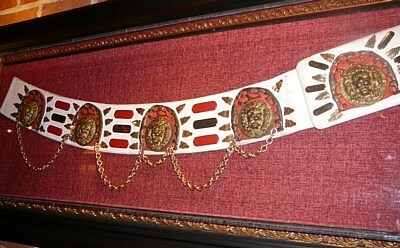 Please Click Here to see more of my Elvis Week photos including Graceland & Elvis displays. Today was the day for movies with an Elvis film festival running all morning and afternoon at Malco's Theatre down on Court Ave. 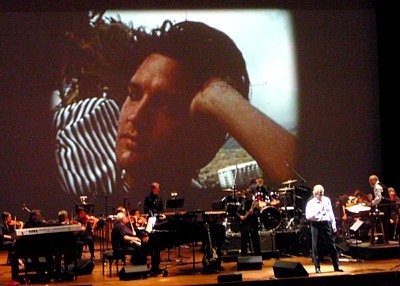 Showing were Jailhouse Rock, Fun in Acapulco, Roustabout and King Creole. And seeing that the weather is once again back to low 90's and plenty of sunshine - what better way to get out of the sun and cool down and take in a few of the King's movies. Also today at 5pm at the Peabody was the marching of the ducks - but this year, they were accompanied by all the ETA contestants, for a special parade. The town has definately filled up with alot more fans rolling in today. Lots of folks were planning to see last years ETA contest winner Shawn Klush tonight as he performs in concert with the Sweet Inspirations at the Cannon Centre. I myself, made my way to revisit the place where it all began for Elvis - Sun Studios on Beale Street. 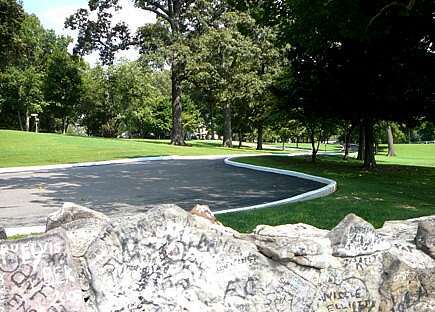 The shuttle from Graceland will take you and bing back for free (on the hour, every hour). 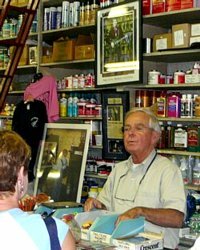 The studio is a lot smaller than you would imagine and there is a stack of great music too be bought from its little store on the way out - not only Elvis, but vintage Roy Orbison, Johnny Cash & Jerry Lee Lewis, just to name very few. From there it was over to the Memphis Plaza Hotel (the old Clarion) to check out the memorabilia convention - it was all very busy packed with fans and some awesome stuff to check out. However, just as exciting is the launch of "The Genuine Elvis" – on 14th August. Authors Ronnie McDowell and Eddie Hand, will be at Graceland Plaza in person to autograph copies of this book that promises untold stories, previously unpublished photography – along with pictures from Alfred Wertheimer. But perhaps most exciting of all, this book includes the never-before-told story of the exclusive 1956 interview that DJ Charles Watts recorded with Elvis and his mother Gladys and father Vernon. 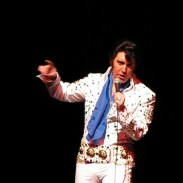 For fans of Elvis Tribute Artists I was nearby to gather the gossip about last night's semi finals of the UTA contest. Those in the know were scoring Nathan Belt (right) & Bill Cherry as the only real talent there. Strolling back to the Graceland tent for some more Elvis action, I found it at capacity tonight and the music was really rocking. The temperature was dipping and just beautiful for a wander up to the Meditation Garden this evening - at least 50 people up there and lots more floral tributes lining the driveway. Earlier I chatted with Derek Phillips about the sad loss of Elvis photographer and great guy Harold Newton only 2 months ago. It was nice to see a placard noting his sad passing and that he wasn't forgotten. Of the city by night"
Today's weather was somewhat cooler and a little overcast after the thunderstorm that passed through the Graceland area last night, in which a huge tree on the mansion grounds fell to the ground damaging one of the fences. 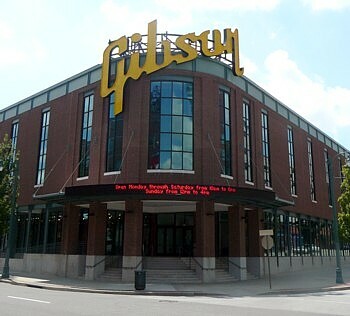 I thought I would head downtown again, this time to check out the Gibson Guitar Factory down on Beale St - very interesting and some great stuff in their gift shop – not to mention the opportunity to pick up one of many Gibson models to have a play on while you are there. After that it was more shopping down Beale St, where who should I run in to but ETA winner Shawn Klush lunching with Estelle Brown from the Sweet Inspirations. Shawn Klush is ever present around Memphis this year and was in fine form. I dropped by the Hard Rock Cafe to pick up my 2009 special edition Elvis week pin – only to be told that they had sold out in the first 2 days! Headed back to Graceland to finish off my tour – took in the auto museum – one of my favourite parts of the tour. 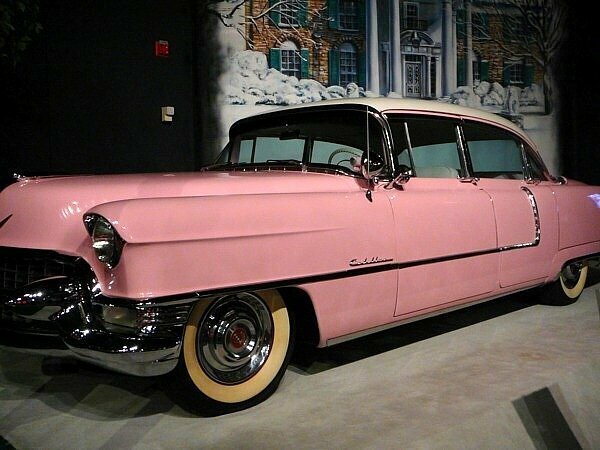 There are about a dozen of Elvis' most well known cars on display including a Ferrari, 2 x Stutz's, 2 x Rolls Royces, a custom-made limousine and the famous pink Cadillac he bought for Gladys. 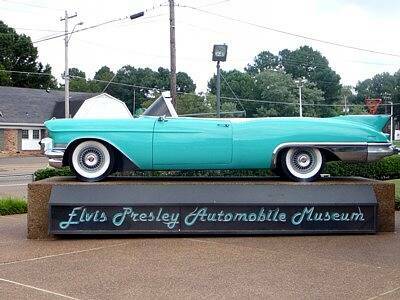 There are also golf carts, motor bikes, tricycles and the newest addition to the museum – Elvis' green tractor. 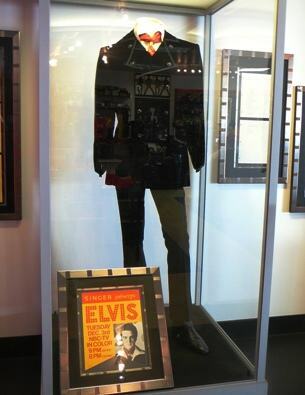 From there, I visited the Sincerely Elvis museum – which has been transformed into all things Hollywood – original posters, scripts, on-set photographs, props and Elvis' costumes from several different films. These are well laid out displays with some gorgeous new memorabilia. I especially liked the Blue Hawaii lay out - and of course the Viva Las Vegas one. Lucky Jackson: Can we help you? Yes ma'am. Lucky Jackson: I don't blame it! I finished off my tour with a quick walk through of the Lisa Marie and Hound Dog 2. Some good entertainment at the tent this afternoon and quite a good turn out, probably due to the welcomed cooler weather. In a strange move EPE has not laid on their Elvis Expo this year. Rumours on the ground are that they didn't make enough money from it last year! It seems that in 2009 they want you to buy your Elvis Plastic Ducks on-line instead!!! So after a blast of music I checked out some genuine Elvis quality merchandise. Today was the first day of all 3 organised 3 Memorabilia Conventions being held this week at The Scottish Inn, The Memphis Plaza (formerly the Clarion) and The Peabody. As the Scottish Inn is only a few doors down from Graceland itself, its here that I visited first. Some good stuff, but only a small display. 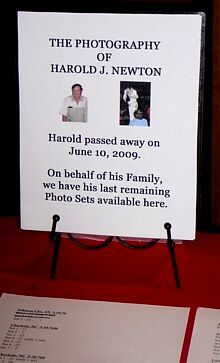 Tomorrow however, I'm very keen to visit the memorabilia convention at the Clarion (now The Memphis Plaza Hotel) on Brooks Rd, where my good friend Derek Phillips not only has his fabulous collection of George Hill photographs for sale, but also the remaining photos from the late photographer Harold Newton's collection. There are some absolute stunners so make sure you check them out. I also have to mention that Derek is also involved in the upcoming and much anticipated Dixieland Delight – and a new set of photos from the book will also be available. Sorry for the delay but an Elvis girl's life can get very busy at times especially in Memphis! My Elvis Week days 2 and 3 have both been full-on with plenty to do and see. Please click here to see more of my Elvis Week photos including more of Graceland and the Elvis '68 display. After checking out the entries to this year's art contest (yet to be judged) on display at Graceland Plaza, I lined up to board the shuttle over to Graceland. As the bus weaved up the driveway towards the mansion entrance, I realised that the excitement of going through that front door, never subsides - no matter how many times you have been there. Once again I was standing inside Elvis' haven, air-conditioned to the point of actually feeling cold in this hot Memphis weather – just how Elvis liked it. 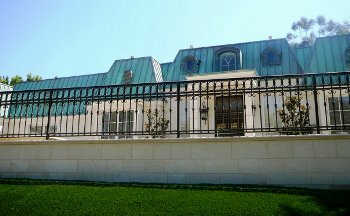 Looking around Graceland, one can almost instantly imagine its rooms filled with people milling around, laughter, music and good times that must have been these walls. 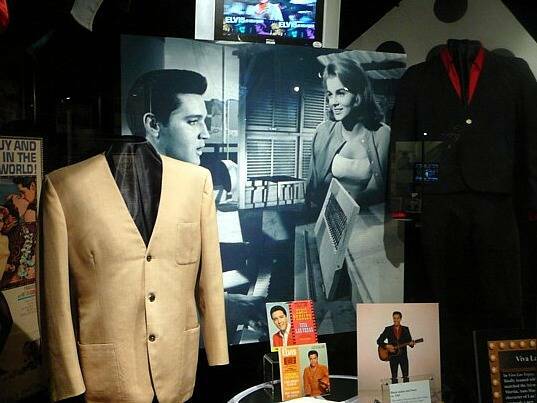 Displays in the lounge, dining room, basement, kitchen and jungle rooms remain the same as years past – however, the room that used to house some of Elvis' jewellery, furniture and office effects is no longer part of the regular tour!! This room (set up in what used to be the garage) is now part of the VIP tour only, as is the new tour of the barn which can only be done as a completely separate tour for $15! As my visit to Graceland was early in Elvis Week, there weren't too many floral tributes in the Meditation Garden, but I have noticed a steady increase over the past couple of days. 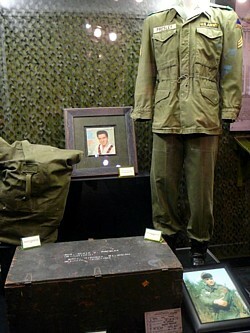 A new addition to the Platinum tour (Mansion, Lisa Marie, Sincerely Elvis, Automobile Museum) is the Army Museum – which displays some very interesting items from Elvis' time of drafting to his return to Graceland. We are treated to a short film with complete footage of the Graceland press conference Elvis gave on his return from he army – along with some rare footage of his time in Germany. Along with many (if not all) of his army greens and dress uniforms are several original documents, including his original draft notice and several receipts and telegrams. That night I took advantage of the evening walk up to the Meditation Garden, to lay my floral tribute. Even though the temperature had barely dropped from what it had been all day (hot! ), the gardens this time of night is somewhat serene – with the sun setting through the trees and nothing but the sound of crickets echoing through the night sky. This quiet time allows you the chance to sit on the steps of Meditation Garden and pay your respects to Elvis, without the crowds milling around. There is no pressure to move along and staff are more than happy to let you sit there for the full hour and a half, should you wish. Time to take the shuttle (free from Graceland Plaza) to downtown Beale Street. It was surprisingly quiet for the middle of the day, but the streets remained shut off to the traffic and made for easy access to all the shops. After a great Southern meal and hospitality at the Blues City Cafe, I made my way over to the Rock'n'Soul Museum. I had heard great things about this place, and I thoroughly enjoyed it. 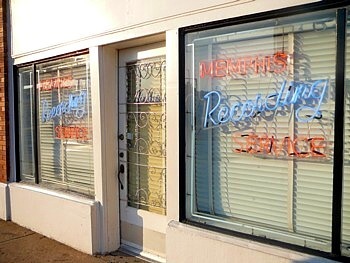 After a 12 minute film detailing how the blues began way back when in Memphis, the remainder of the tour is self-guided by way of a explanatory commentary on a head set which you can stop and start at your leisure. - Original typed lyrics to Heartbreak Hotel with hand written notes. 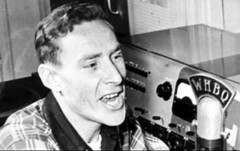 George Klein and Dewey Phillips are also honoured here with displays of items from WHBQ radio and photos of Elvis from their personal collections. 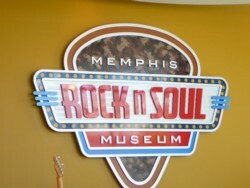 Overall, there is plenty to see, hear and read about at the Rock'n'Soul Museum and for only a $10 entry fee, its a great way to spend an hour or two if you have the time. (Unfortunately photography is forbidden as a lot of items are not behind glass). After that, it was back to Graceland Crossing to check out who was singing at the tent – while a fierce looking thunderstorm rolled through. 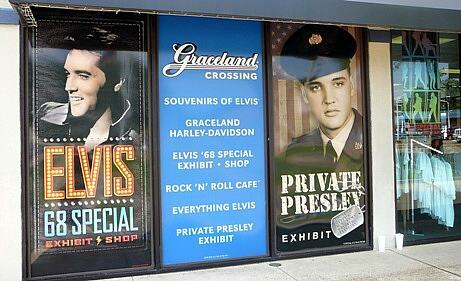 Hopefully the sun will be out tomorrow to take in some more Elvis sights! ... But I feel fine"
Welcome Elvis Friends and it's good to be back in Memphis! 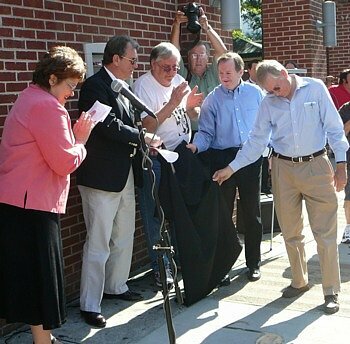 Once again I'll be your roving EIN reporter trying to keep you updated on Everything Elvis at Elvis Week 2009. With so much planned and a packed itinerary you'll have to forgive me if I need a little beauty sleep at times, after all a girl has to relax after a few margueritas! Arrived in the Promised Land completely jet-lagged from flying through the Elvis-laden night sky after leaving LA at midnight. 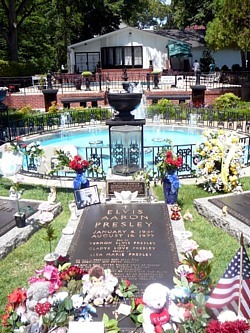 After a relaxing swim, and poolside cocktail I wandered over to the gates to heaven, to have a peek at a very green and sumptuous-looking Graceland and also checked out the shops for some new displays. Very pleased to discover some great merchandise this year, thankfully less kitsch than often. There's some really good designs (Elvis '68, Yum Yum) and surprisingly some very reasonably priced. The new 68 Comeback display in one of the stores near the tent is very nice with 3 suits, red vest, his leather wrist band, original tickets, telegrams, script etc. Combined with a whole store filled with '68 Comeback merchandise this is actually very nice stuff. 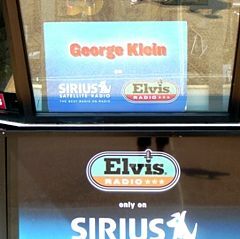 Got to say hello to George Klein who was doing a stint on Sirius Radio - but he seemed pretty tired with the busy build up to Elvis Week. A great bonus this year is that there are now not only morning walk-ups at Graceland but also evening ones every night, which is very cool. Down on Beale Street the music was flowing out the doors, another night of Rock’n’Roll and the Presley excitement is building up. And what a nice bonus-treat since my Elvis EIN photo website hit 1,000 members today! Check it out here. Another Marguerita to celebrate is in order. But it's a long flight from Australia to Vegas to LA to Memphis so it’s time for your roving reporter to get some well-deserved sleep. 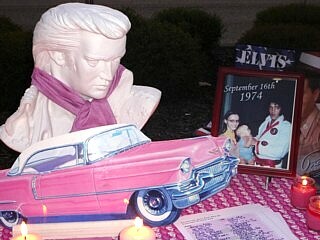 Go here for EPE Elvis Week On-Line Events Schedule. -Copyright EIN August 2009 - Do NOT copy images or text without permission.